Music is an integral part of most Latin American cultures and Costa Rica is no exception. Many of Costa Rica’s musical traditions date back to colonial times, when the Spanish brought European rhythms to the country’s shores. Over time, Spanish beats harmonized with indigenous tempos to create folkloric music unique to Costa Rica. We can provide life-changing outreach opportunities for your choir during your performance tour of Costa Rica. For example, you could have an outreach concert at a Montessori daycare center for children and adults living in extreme poverty. You could sing for the children and parents of this very low-income community who have limited opportunities to experience the joy of music. In addition to performance opportunities, there will be plenty of time to enjoy the tropical rain forests and abundant nature of the Northern area of Costa Rica. You could visit some of the indigenous coffee plantations that this country is famous for and soak up the amazing cloud forest in Monteverde, one of Costa Rica’s most beautiful destinations. 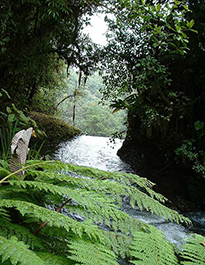 The cloud forest is filled with rich biodiversity and is one of Costa Rica’s Seven Wonders.